Mr. Joseph Dunn graduated from NC State University in 1965 with a B.S. Degree in Aerospace Engineering. He received a Masters Degree from George Washington University in 1973. He was also a project engineering graduate of the United States Naval Test Pilot School. He joined what was then the Naval Air Test Center at Patuxent River, MD. in June 1965 and worked there until he retired in 2001. His work experience was extremely diverse and varied, starting with the Navy F-111B Test Program and including the F-4B/J Programs, foreign aircraft evaluation programs including the Mirage G-1 Program in Estres, France and a year at Boscombe Down, England as the U. S. Navy engineering representative on the original AV-8A Harrier test program. Mr. Dunn was assigned as the Navy’s Lead Flight Test Engineer for the F/A-18 Hornet test program from 1975 until 1982. Mr. Dunn worked as the Technical Director for Projects on the Test Center Staff from 1982 until 1987 and from 1987 until 1991; he was the Naval Air Test Center Program Manager for the A-12 Program; he was heavily involved in the flight test planning for the Joint Strike Fighter Program, which eventually led to the F-35 Program. Awards received by Mr. Dunn include: Outstanding Engineer of the Year at Patuxent River (1968), Outstanding Manager of the Year at Patuxent River (1981) and the Navy Meritorious Civilian Service Award (1991). In 1995, he received the International Society of Flight Test Engineers (SFTE) annual Kelly Johnson award as Outstanding Flight Test Engineer of the Year. 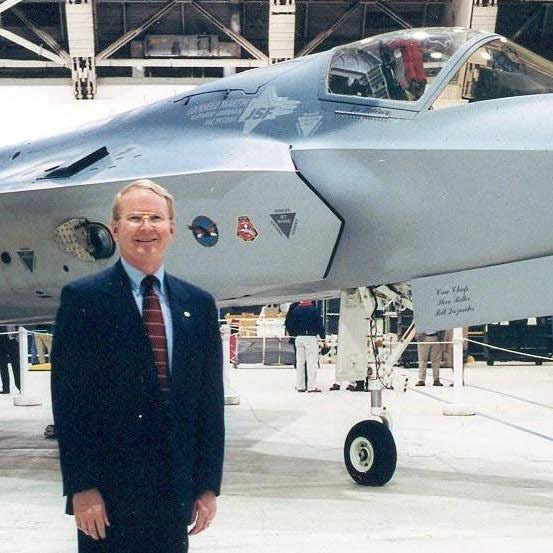 In 2001, he received the DOD Exceptional Civilian Service Award for his work on the Joint Strike Fighter (JSF) Program. After his retirement in 2001 from the Naval Air Systems Command, he spent another 10 years as an independent technical consultant to various Aerospace Companies as well as the Pentagon. He is married to Carolyn Stoffers Dunn and they have two daughters who are NC State graduates as well. Mr. Dunn could not join us today.